Windows 7 (32-bit or 64-bit Professional) and Windows 10 (Windows 10 is still really young, so we still prefer Windows 7). We also still support XP. Dual Core 3Ghz CPU or better (Intel Core i5, and even better Intel Core i7). Xeons work too but overkill. Sound cards - equip with as many channels/audio inputs/outputs as you require (we work with all Windows MME/WAV compatible sound devices). We recommend multi-track/channel cards and balanced audio cards when budget allows. System can restart automatically after power loss IF your BIOS is set to start after power loss, but a UPS prevents the computer from being damaged during brown outs, lightning strikes and power outages. Monitor - 22" or larger recommended for air positions. Dual monitors are supported (extended Windows desktop) and recommended for live assist. Most stations use the same on-air computer which plays over the air to also be used for background/autorecording. It is not necessary to setup a separate computer to autorecord unless you're trying to autorecord multiple things at the same time (however, even recording two things at once while playing over the air isn't a big deal on today's typical computers). Most stations have two identically equipped computers and have our software installed on the 2nd computer which is used primarily for production (this is where you run your 3rd party digital audio editor, CD-ripping program, do your CD/DVD copying, burning, etc). While nothing stops you from doing anything you want on the on-air computer, most stations do not let people browse the Internet, do email or even multi-track edit on the on-air computer for obvious reasons. When a production machine has the software installed, you can setup the machines to SYNC within our software so production and on-air maintain the same inventory, logs, playlists, etc for operational redundancy. Some stations take this to the extreme having two on-air computers, plus one or more production computers. 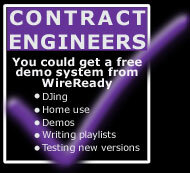 All *.WAV compatible production/editing systems (MAC or PC) are compatible with our software. Some stations also use a central server for central storage. We support this. Our system can play audio over LANs from servers, and we can be setup to automatically cache files down from central servers to local mahcines where the playout actually occurs. These are independant of the software and strictly a user configuration decision. For under 10 machines, stations often just dedicate an extra computer to their central server. Some stations buy true servers with server operating systems, other use NAS devices. We don't care. They all work. We're happy to source/supply whatever you need, or we'll use whatever you buy locally. True servers and NAS devices can support more than 10 machines. Want a Central Server -we sell 2TB and larger Synology NAS servers starting at $1,495 ready for use.